General Film Corp. - 107 min. Principal Cast: James Rolleston, Lawrence Makoare, Te Kohe Tuhaka, Xavier Horan, Raukura Turei, George Henare, Rena Owen. Crew: Screenplay: Glenn Standring; Cinematographer: Leon Narbey; Editor: Dan Kircher; Original Music: Don McGlashan; Production Designer: Grant Major; Costume Designer: Barbara Darragh; Hair, Make-up and Prosthetics Designer: Davina Lamont; Visual Effects Supervisor: George Zwier; Stunt Coordinator: Steve McQuillan; Sound Designer: James Hayday; Producers: Matthew Metcalfe, Glenn Standring; Director: Toa Fraser. 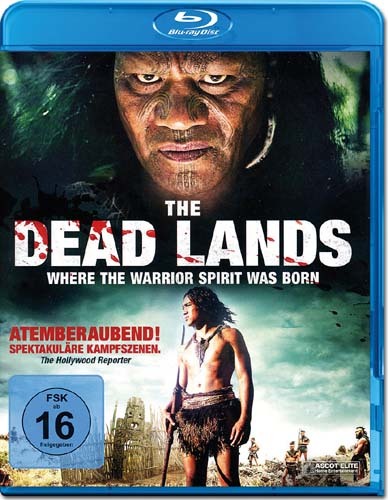 After his tribe is slaughtered through an act of treachery, Hongi, a Maori chieftain's son, must avenge his father's murder in order to bring peace and honor to the souls of his loved ones. Vastly outnumbered by a band of villains, Hongi's only hope is to pass throught the feared and forbidden 'Dead Lands' and forge an uneasy alliance with the ruthless fighter who has ruled the area for years. Starting 15 April 2015, a PAL R4 dvd can be purchased from AU and NZ sources for about $33au & $40nz. It is presented in its original 2.35:1 format, 16x9 enhanced, with a DD Surround 5.1 Maori language track. There are English subtitles. There are extras: 'Behind the Scenes', martial arts training and trailer. There is a German PAL R2 version DVD available starting 21 April for about 18eur with spoken German and Maori tracks and subtitles in German and English. There are R0 1080p Blu-ray versions from New Zealand, Australian and German sources. The basic specs are the same as the DVD, except the soundtrack is DTS-HD-MA 5.1. Confirmation about details, including extras will be confirmed later. A spoken French language version, with French subtitles and the original spoken Maori track was released 29 July 2015 on both Blu-ray and DVD. A US Region A Blu-ray and a Region 1 DVD offering started 04 August 2015, priced at $12us and $10us respectively. 2014 - New Zealand Film Awards 'The Moas' - Best Make-up Design (Davina Lamont), Best Costume Design (Barbara Darragh), Best Visual Effects (George Zwier).